At first it may feel cool, and then a warm feeling is often felt below the surface of your skin. Therapeutic ultrasound uses high-frequency, inaudible sound waves to treat a variety of soft tissue injuries. 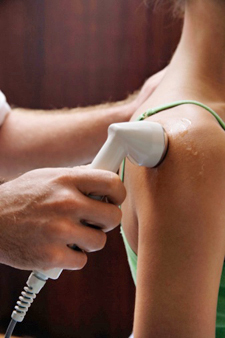 Ultrasound is applied using a round-headed wand or probe that is placed in direct contact with your skin. At first, you’ll feel the coolness of the gel used to improve sound conduction. Then, you’re likely to feel a pleasant, warm feeling beneath your skin in the region being treated. When these high frequency sound waves are directed to soft tissues and joints, the rise in temperature increases blood flow to the region, relaxes muscle spasms, increases metabolism and promotes your body’s healing response. Think of ultrasound as a form of deep tissue micro-massage, helping reduce swelling, increase blood flow, decrease pain, reduce joint stiffness and stimulate cell-repair. A typical ultrasound treatment can take from 3-5 minutes. However, in cases where scar tissue is present, treatment time can be longer. During the treatment, the ultrasound probe is kept in constant motion. Naturally, we avoid using ultrasound where there are malignancies, metal implants below the area treated, vascular abnormalities and on the abdomen of pregnant women.